Derry secured the Division Four Football League title as they recovered from a slow start to beat Leitrim 0-20 to 0-16 at Croke Park. Leitrim led 0-7 to 0-4 after 22 minutes but Derry hit six straight points before half-time to move three ahead. With midfielder Padraig Cassidy outstanding throughout, Shane McGuigan produced a sensational second half as he finished with six points. 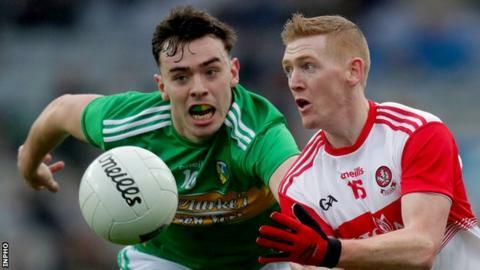 Derry extended their lead to six which left Leitrim with too much to do. As was predicted, Derry fans were outnumbered by the order of 20-1 at Croke Park as an estimated 10,000 Leitrim people - almost a third of the county's population - turned up to cheer their team. Right to the end, every Leitrim score was greeted with cheers with Derry's scores barely registering among the crowd. Leitrim showed impressive pace in the opening 20 minutes as two points from forward star Ryan O'Rourke helped them lead 0-6 to 0-3 and 0-7 to 0-4. However, the Connacht county missed further crucial chances and they were made to pay in the 13 minutes before half-time as points from Ryan Bell, McGuigan, Enda Lynn (two) and Emmet Bradley (two) suddenly put the Oak Leafers three ahead at half-time. One of Lynn's two points could have resulted in a goal as he opted to fist over instead of finding the over-lapping Bell. An Emlyn Mulligan point cut Derry's lead to two immediately after the restart but that was as close as they got during the remainder of the contest. McGuigan's five superb long-range points were the main feature of Derry's dominant second half as the Slaughtneil man could do no wrong as he shot on sight with his left foot. His club-mate and Derry skipper Chrissy McKaigue also hit two fine second-half points before lifting the Division Four silverware. Lynn and Bell both finished with 0-3 for Derry with Christopher Bradley and Emmett Bradley both notching 0-2 for the winners. Derry: T Mallon; K McKaigue, B Rogers, P McNeill; M McEvoy, C McKaigue (capt), N Keenan; P Cassidy, C McAtamney; E Bradley, E Lynn, C Doherty; S McGuigan, R Bell, C Bradley. Subs: B McKinles, E Concannon, P Coney, R Dougan, B Heron, C Mulholland, E McGill, P McGrogan, S Quinn, J Rocks, N Toner.